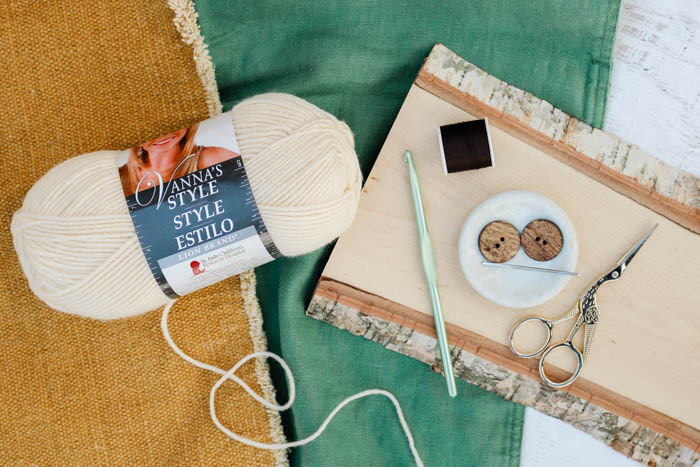 Join makers and doers around the world each each week in May to learn to crochet your own modern, lightweight cardigan, aided by real-time support and weekly step-by-step video tutorials! 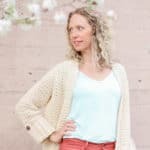 The Alchemy Cardigan Crochet Along 2018 is part of a partnership with my friends at LoveCrochet.com. This post contains affiliate links. Raise your hand if you like modern comfy sweaters, video tutorials and other people who love yarn. Me too! That’s why I’m thrilled to announce a new project I’ve been working on for quite some time with my friends at LoveCrochet.com. I’m convinced Make & Do Crew has the most friendly and creative “hookers” in all the internet land, so I’m super excited for us all to come together (digitally speaking, at least!) and make a project side-by-side during the month of May. Are you already hooked?! Great, head to LoveCrochet.com to grab your yarn pack and a copy of the printable pattern. This crochet along party kicks off May 7! 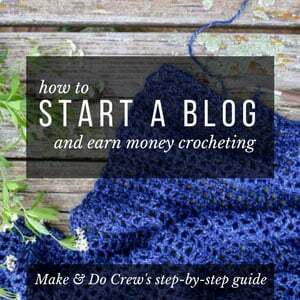 Never done a crochet along and need more details? Watch the :30 video below to see this lightweight sweater in action and then read on! What is the Alchemy Cardigan Crochet Along? A crochet along simply means that crocheters across the land all make the same pattern at the same time. You choose your yarn color and then in May, the four stages of the CAL will each be released weekly on MakeAndDoCrew.com and in the printable pattern PDF available for purchase on LoveCrochet.com. 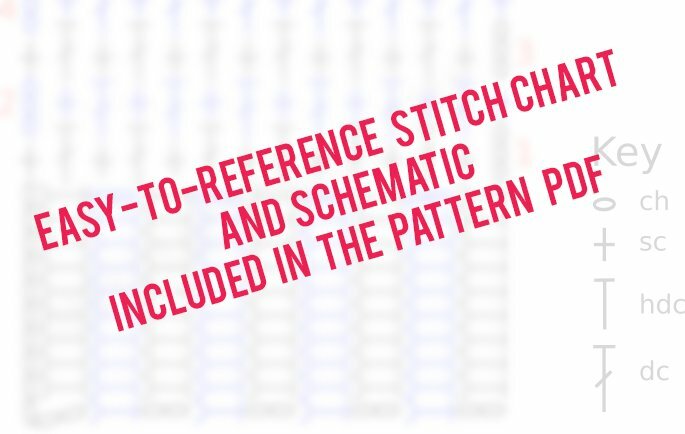 If you’re a couch crocheter, you’ll probably want to purchase the ad-free, easily printable pattern PDF, which includes a helpful stitch chart and schematic. Grab it here! How does this crochet along work? Beginning May 7th, Part 1 of the pattern and the step-by-step video tutorial will be released on MakeAndDoCrew.com. Each stage of the CAL will be offered for free right here on the blog or you can purchase the ad-free, printable PDF with stitch chart for $5 here. You’ll only pay once, but then the PDF will be updated each week so can download it with the instructions for the new CAL stage. There will be lots of helpful crocheters in the Love Crochet CAL Facebook group working right alongside you, so be sure to hop over there to join in. I’m also excited to announce that Make & Do Crew new has a new crochet community of our own on Facebook. Come join in our own little group here to share photos of your projects, ask questions and get to know other yarn-lovin’ makers & doers like you. Each following Monday for the next three weeks in May, a new stage of the pattern and an additional step-by-step video tutorial will be revealed. You can take as much time as you need to complete each stage–they’ll be waiting there for you whenever you’re ready! Where and when do I get my yarn? Now! 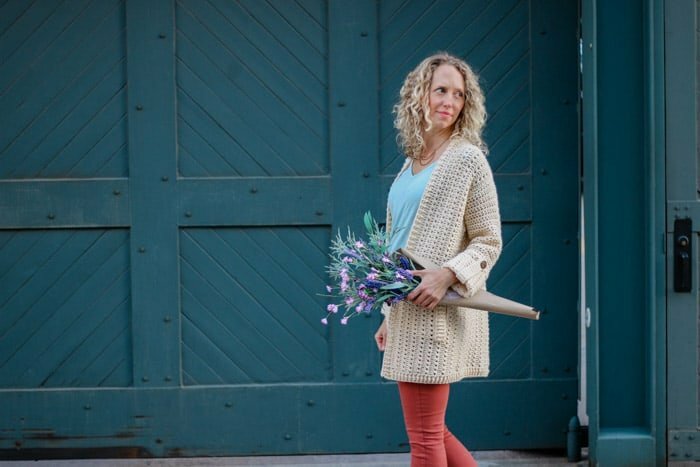 The crochet along begins in less than two weeks, so head to LoveCrochet.com to purchase your favorite color of Lion Brand Vanna’s Style. This yarn is lovely to work with, completely washable and wonderful for warm weather crocheting. Plus, Love Crochet’s price is fantastic — you can make the whole sweater starting at less than $30! Order now here so your yarn will arrive in time for the CAL kickoff on May 7th! While at Love Crochet, you can also easily see the details on hook size and other supplies you’ll need for the CAL. A special note to those chunky yarn junkies: Before you start thinking that we’re gonna be crocheting with dental floss, let me assure you that this DK weight yarn is still going to give you a healthy dose of the quick gratification you crave. 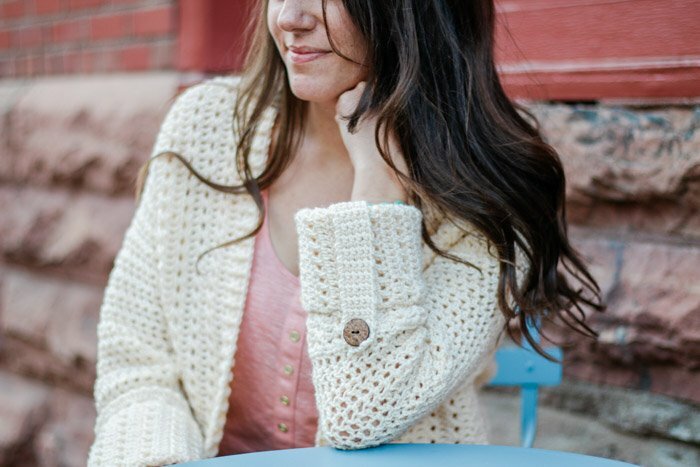 Because this cardigan is fairly fitted, the total amount of crocheting is less than something like the Habitat Cardigan making it a perfect project to whip up over the course of a month. Can I make the sweater at a later date? While we’d love to have you join us real time, the pattern and video tutorials will be available here on Make & Do Crew and on LoveCrochet.com after the CAL concludes, so you can order your yarn now and crochet at whatever pace works best for you. • Be sure to order your yarn here and purchase the ad-free PDF here if you’ll want a printable copy of the pattern when it’s released. • Join the Love Crochet CAL Facebook group and the Make & Do Crochet Crew Facebook group to meet other helpful crocheters. • If you’d like, enter your email address below to be notified as soon as the first stage of the CAL is released! Just received your yarn in the mail? Starting your sweater? SHOW US! 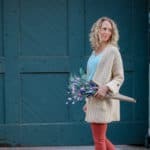 I’d love to follow along with your Alchemy Cardigan journey. Use #alchemyCAL and tag us on Instagram (@lovecrochetcom and @makeanddocrew) to show off your stitches! Please shout in the comments if you have any questions or if you already know you’ll be crocheting along with me. I’d love to hear from you! WANT A REMINDER WHEN PART 1 OF THE PATTERN IS RELEASED? I'll send you a note right away so you don't miss a minute of the Alchemy Cardigan crochet party! 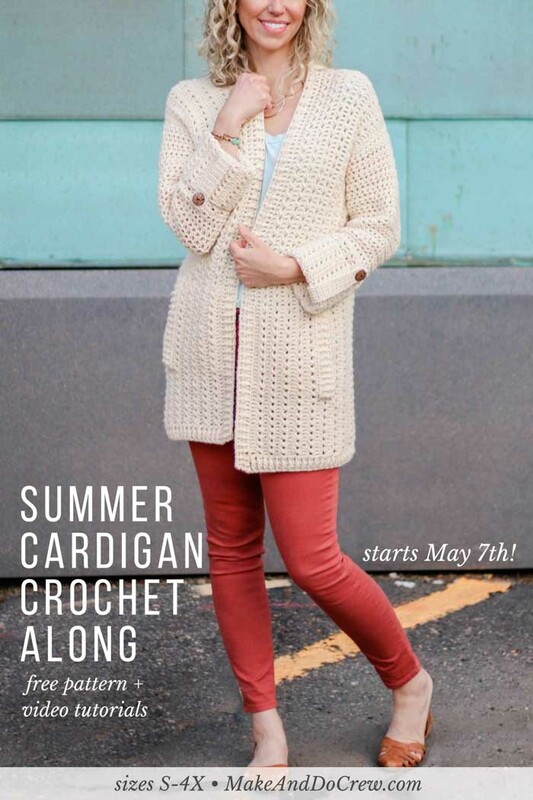 « Part 2: Day Date Easy Crochet Cardigan Pattern – Free! Thanks for your feedback, Patricia. I love buttons too. I’ll keep that in mind when designing cardigans in the future! I may not live long enough to crochet this it drags on and on and on! I just finished your Habitat cardigan in teal. Love it, and want to share a picture with you. How do I do that? Can I also brag about it on Ravelry? I’d love for you to share a pic on Instagram with the hashtag #makeanddocrew (and tag me @makeanddocrew), but if you’re not a big IG-er, you can email me too. Jess (at) makeanddocrew (dot) com. What an attractive stitch pattern! I’m not big on stitching pieces together (can’t sew to save my life), but this looks like a pattern I have to try. Thank you so much for sharing it with us! I feel you on the seaming. I hope that knowing that we’re all doing it together during the crochet along gives you some inspiration to try it out! You crochet soooo much, how on earth do you crochet and not get carpal tunnel???? I have to crochet in small doses so as not to have it flair up. Do you wear a brace for carpel tunnel? I know carpel tunnel can be super irritating and painful. I’m glad you’re still able to crochet, even if in small doses. Fabulous idea Jess – the nursing pillow. I’m on the internet hunting one down right now! Yay! I’m so happy to hear you’re making progress on your Staycation Cardigan and that you’re going to join us on this one. Very pretty. Any chance I can use vanna’s choice instead of vanna’s style. I can’t find it on the yarn canada site. I live in CO and making a cardigan out of acrylic definitely won’t be able to be used more than 4 or so months a year. Would there be any problem with my substituting a dk/light 3one ply Malabrigo in place so I’m more likely to be able to use it year round for this pattern? I understand it will look a bit different, but given the pattern, which I haven’t yet seen, do you anticipate any problems with my doing so? Thank you and thanks for this CAL – gearing up for autumn in the future as well. I’m in Colorado too! I think a substitution like that would work just fine. As long as you can achieve the pattern gauge, I think it will be lovely! Feel free to share a pic if you’d like on Instagram (with #AlchemyCAL) or in the Love Crochet CAL Facebook group. I’d love to see it! Help – I’m a senior and I haven’t crocheted in a very long time. I used to do vests and skirts, ( from my time) Do you think this would be too intricate for me. Is it done on a fairly large hook? I do need a little advice. that looks like a lovely sweater and just one I could use in FL. Would you like to take a look at the video tutorial here and see if it seems doable or way too overwhelming for you? If you have decent pattern reading skills, I think you’ll be okay, but if you want a simpler sweater to try first, you might enjoy the Habitat Cardigan or Day Date Cardigan, both of which also have video tutorials. I hope that helps you make up your mind! My yarn should be arriving Friday, I’m excited to begin this CAL! It’s the first I’ll have participated in, you’ve designed such a lovely pattern!! Thank you so much, Kelly. I’m glad you’ll be joining us! It’s my first CAL too! Hi Jess! I am very interested in this CAL but lives in Namibia and I don’t have access to a wide range of yarn. I want to crochet this cardigan for the winter and I want to do it with a chunky yarn. Will it be possible? Hello from Colorado, USA! Unfortunately, I don’t think this will work out in a heavier yarn very well because the gauge will be all off. The highest I’d go is probably a worsted weight and then you’d need to size down in the pattern so it would still fit you. I’m sorry I don’t have a better answer for you! Just a short note toe say” if you are trying to teach someone to knit,make sure thy are doing it right haneded. I found this out the hared ay. After many hours of trying to show my Mom how to knit. Found out she was a left handed knitter. WHEW She did every thing else righted. When does the cal video start? Yes, I am also looking for the video portion of this crochet along. I am looking for Part 1 of the Alchemy Cardigan but cannot find it here. Can you tell me where to get part 1??? 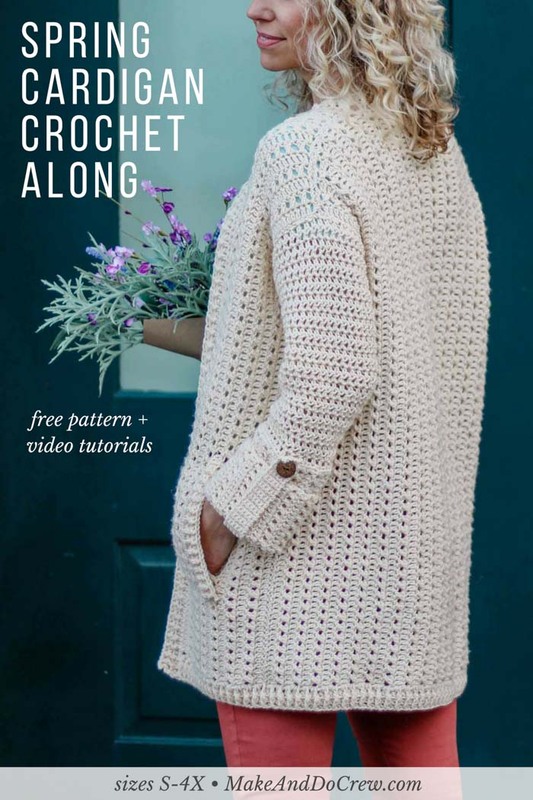 I am looking for Part 2 of the free pattern. We really like your alchemy cardigan. I was wondering if i may translate it in Dutch and use it later on as a Cal on our facebookgroup. Of course all credit will be directed to you.